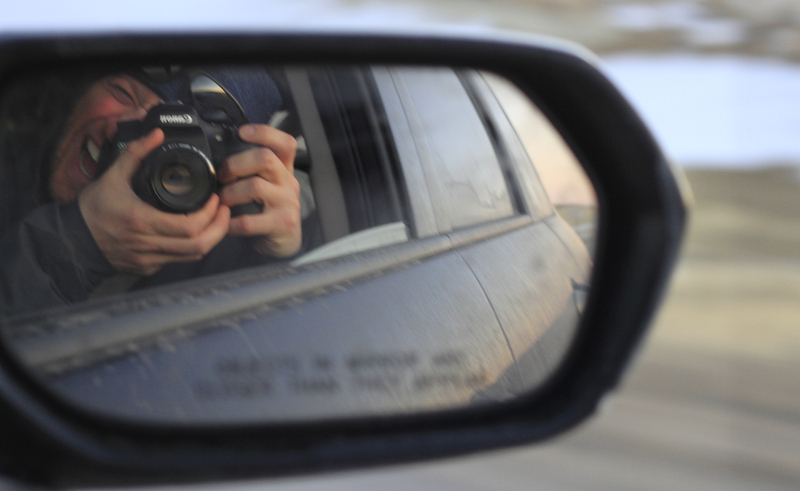 This entry was posted in Photography, Trip Reports and tagged Jackson, Jackson Hole, Photography, pow, powder, powskier, Road Trip, ski, skiing, snow, Teton, Wolf, Wyoming, yellowstone. Bookmark the permalink. You capture such incredible emotion in these pix — whether from humans, animals or landscape. Gorgeous work! Loce the shot of Abby and the mountains in the background. What a gorgeous place. I totally love the photo of Zion’s eye–so penetrating! Congrats on FP. Brilliant! I loved your wolf photos. thank you so much for sharing. Road and Wolf eyes.. Awetastic..
How beautiful the pics are!! Remind me to NEVER mess with a wolf! Very cool shots, my friend! The mountain pic is spectacular! wow… this is seriously cool. I live in South Dakota and no longer have an irrational fear of wolves making their way back here again. Our local paper provides short clips of the news from 100, 50, and 25 years ago, and in the “100 years ago on this day” it is often reported of wolves killing livestock or being hunted, much like the mountain lion is now in the Black Hills. Sounds like a great trip! How lucky that you got to see a grey wolf, I loved seeing the pictures too. awesome pics. sounds like a great trip. 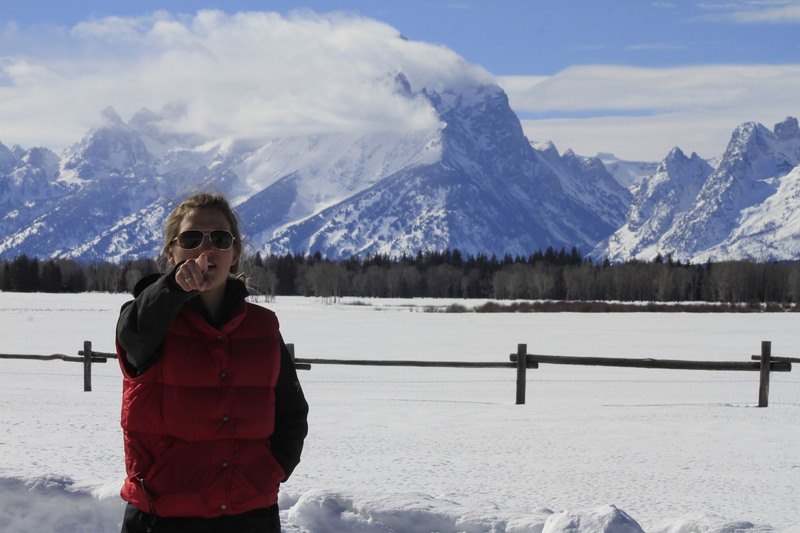 I am not a big winter sports fan (I am half black; we are notoriously absent from the Winter Games) but would love to go to the Tetons. 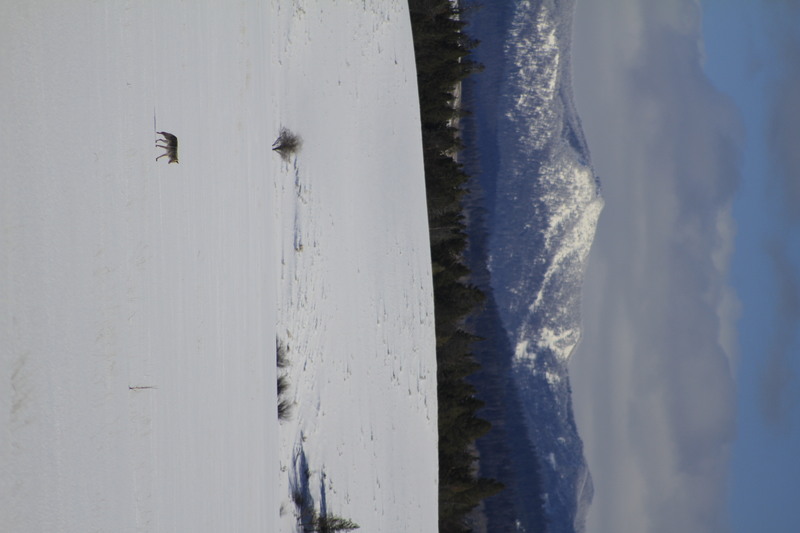 That must have been thrilling to spot the grey wolf; almost like a scene from Game Of Thrones. That is actually the dogs eye. Didn’t get that intimate with the wolf. Looks like such an awesome trip!! The photos of the wolf are really cool! Amazing pics and wonderful description of a wolf in all its natural glory. Thanks. OOHH MYY!! i absolutely adore that picture of the close up of the wolf.. it’s amazing!!! Your pics are gorgeous – do you heliski? My cousin posts those on his website – I thought you guys might have a common point. It’s at heliski.com – if you want to look. Love this! Nice work. I live in Jackson, so happy to have people like you exemplify it’s beauty! Here’s my take on my non-powder-but-nonetheless-amazing-day yesterday. Great photos and AMAZING experience. Thanks for sharing and thanks for letting us see that beautiful place through your lens. Keep up the good work! Cheers..
Beautiful Photo Essay of the beloved Tetons. Great shots of the wolf. Amazing. Love that your dog tried to “stare” his way out of the car. Really enjoyed your post. Congrats on being FP’s. Beautiful….just beautiful….the writing and the pics….Keep ’em coming POWMAN!! Nice write up about your trip! I always love reading what others think about our neighborhood here in Wyoming. Take Care and be sure to visit us in Wyoming again!! Hmm, very interesting. Thanks for sharing. I would agree, by all appearances it is a coyote. 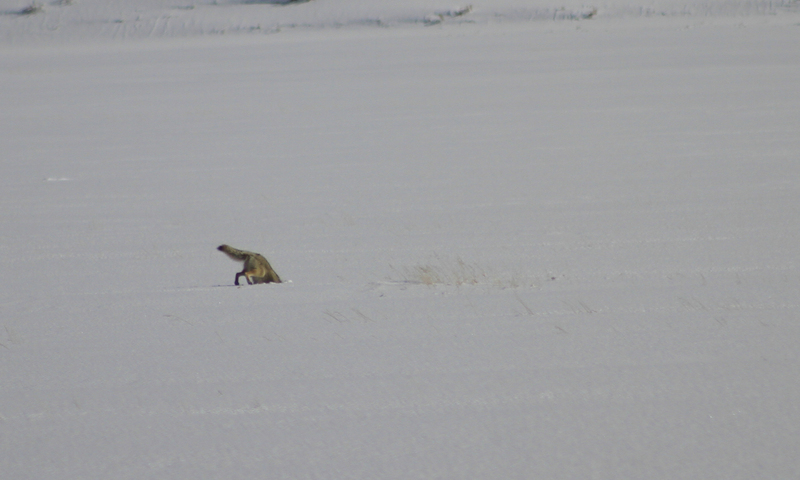 More than wolves, they are also likely to hunt solitary and for small rodents like this. 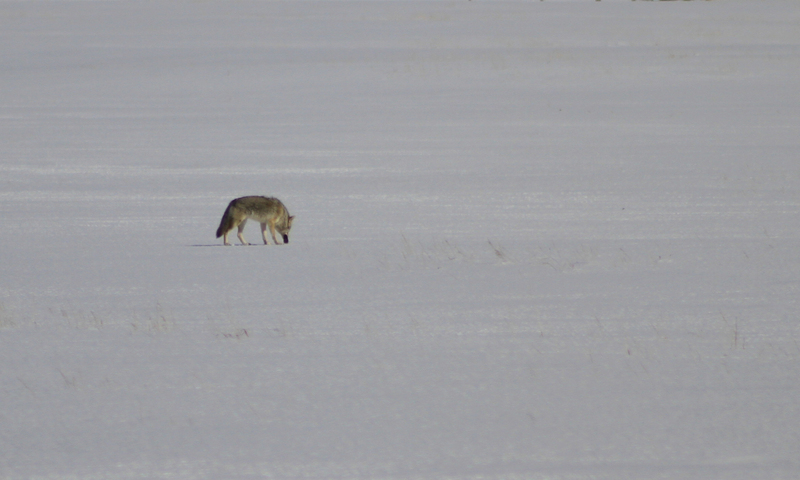 While not as rare, coyotes are still cool to see in the wild! The fun you had shows in your photos. Nice black & whites scenics. Wow! You got to see a wolf in the wild! Lucky. I was watching a documentary about wolves the other day and apparently they’re slowly creeping back down into America. I’ve just finished reading White Fang and I’m a little wolf crazy at the moment. They are beautiful animals. 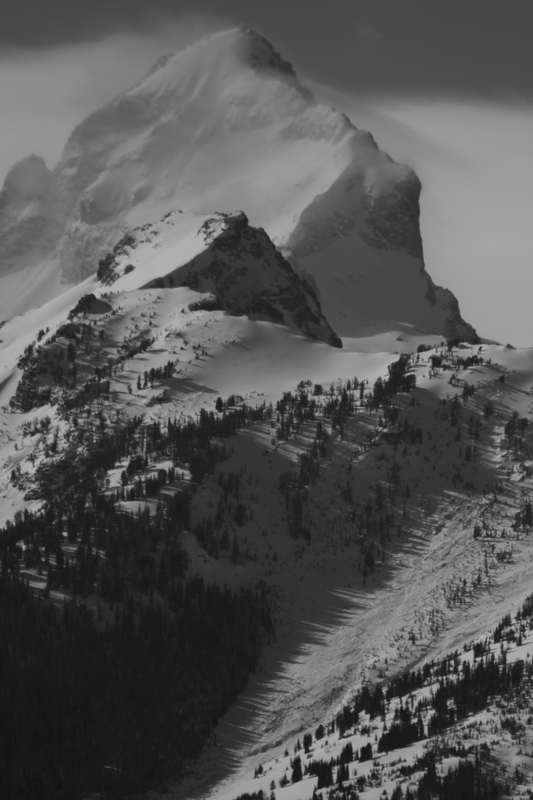 The Grand Teton is a fantastic photo, very Ansel Adams. Great post. I love the pictures especially the one of the dog’s eye. Ski trips are so fun and it reminds me of the ones i have been on. Keep up the blogging and travelling. The picture: “Zion locked on the grey wolf” is absolulty amazing, stunning! I heart how you describe Jackson! It gave me goose bumps! Glad you love the west!!! makes me wanna go to jackson!! Jackson Hole, that brings back some wonderful memories. Both of amazing skiing, and great nightlife, :). Wow! I think the mountains are beautiful but how awesome is it to see a wild animal capture prey? Pretty cool! Thanks for sharing! I was totally reminiscing – except without the snow. I visted Grand Teton NP and Jackson in early autumn in ’10. Love the pics of the wolf – you must have been stoked? 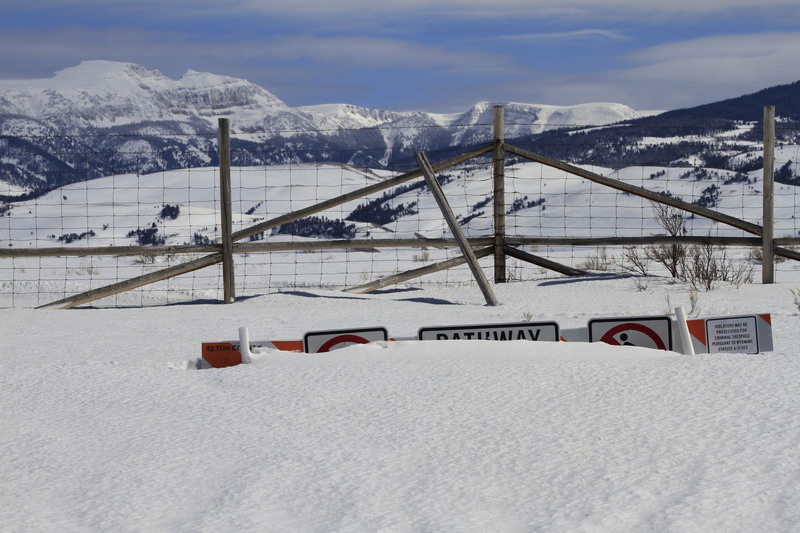 I must admit I was looking forward to possibly seeing the arch of elk antlers in snow – but ohwell! My home town! Aw, I haven’t been there in a while, thank you for “bringing” me home! Loved the photos of the dancing wolf. Thanks! Love your post and your pictures. We were married at the park right before Memorial Day. We love the beauty of the Grand Tetons. Our dog is also named Zion. She is named after the National Park. Great post! Great Photos!!! Looks like you had a great time. Great writing and awesome photos. Love the black and white shot of the mountain. Stunning. We have some beautiful mountains close by (I’m in Colorado Springs) but those of the Tetons are so majestic. How can I share a few mountain shots? Great wolf pictures. They pounce upon prey just like a red fox. 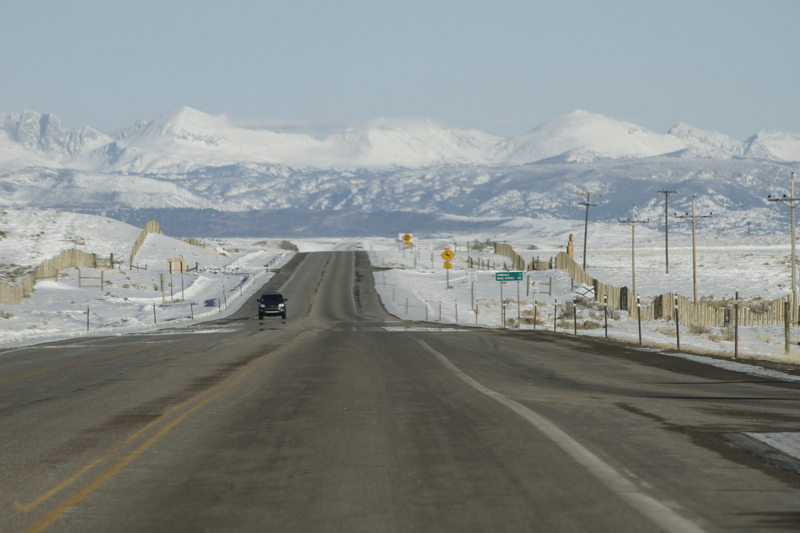 What a great location to capture and bring forth to us as Wyoming is typically overlooked for its scenary. Exellent writing and photos as well. So you didn’t SKI??? Oh – 😦 Great photos! Awesome mt. scenes! Thanks for the tour! Oh we skied, it was unreal. Oh cool! 😉 I just thot you got there and they were closed for the season … I know it’s rough that they are not open longer but some of that is regulated by the forest service but mostly by the turnout … 🙂 Peoples are more interested in mowing their grass than cutting up the slopes … I know – I grew up at a ski area in Alaska. 😉 See ya! amazing shots of snow-covered mountain tops.. so picture perfect.. love the photos.. oh and zion’s eyes are so beautiful. One of my favorite places ever and the Teton’s do hold a certain sway over you covered in snow. I love that area so much and miss living three hours away. Thanks for reminding me of the beauty of this area. You skied and skied and skied. And who is the photographer? Annie, It is the blogger behind the camera!! How do I know? He’s my son! Be well and happy…. Brilliant photos! Would love to see some of those ski-snaps . I want to go to Jackson for the next dump! Your photos are bloody good as well. Good work. “Over there!” –> I love it! From one former Granite Stater to another, wishing you a warm welcome to Wyo! heey i want to make that trip too! The only thing better than summer, is fresh winter powder! Not gonns lie, I clicked on this aticle thinking you may have been speaking of Jackson, TN…my hometown. Not so many mountains, or snow in these parts.